The Sunsilk’s Smooth and Manageable shampoo is perfect for daily use – made with Almond, Argan, Coconut, Jojoba, and Olive Oil to nourish and make your hair so easy to style! Each use also leaves your hair with an all-day fruity, floral fragrance. You want things to be manageable? This unique formula co-created with Yuko Yamashita has Argan Oil and Fresh Floral Fragrance to make hair smooth & fragrant. 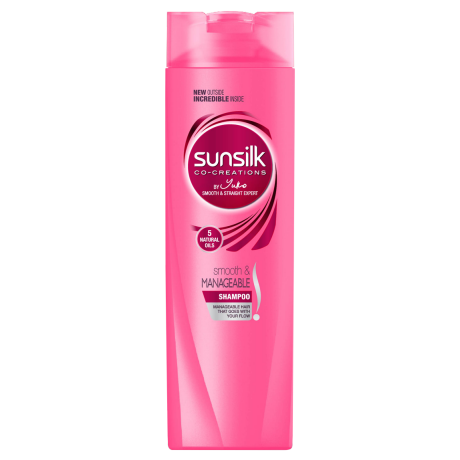 Best results when followed up with use of Sunsilk Smooth and Manageable Conditioner. Hair shinier than ever, so you can sweep all before you in your day to day life! NOT SURE WHAT YOU ARE LOOKING FOR? HERE IS A LITTLE MORE INFO. Wave goodbye to frizz and say hello to smooth and bangong-gigil hair this summer! Easily achieve hair that’s as smooth and fresh as you are!